In God Gave Us Love, Little Cub and Grampa Bear’s fishing adventure is interrupted by mischievous otters, and the young polar bear begins to ask questions like why must we love others . . . even the seemingly unlovable? Why is it easier to love those we like? Where does love come from? And why does God love her so much? Grampa Bear patiently addresses each one of Little Cub’s curiosities by explaining the different kinds of love we can share: the love between friends, the love between families, the love between moms and dads, and the love for God. He also assured Little Cub that because of the love God has given her through his Son, there’s nothing she can do to make God love her any more or any less. Through Grampa Bear’s encouraging Little Cub to love others with a “God-sized love,” children will be inspired to love others and to be patient, gentle and kind, so that in every way, they too can demonstrate God’s love. Her questions reflect the confusion of so many children during the holiday season. And this heartwarming story takes them on a wonderful journey of discovery—right to the heart of Christmas. Through Mama’s gentle guidance, Little Cub learns that God loves her and everyone— polar bear, moose, or human—so much that he gave us Jesus, the very best gift of all. Both of these books is beautifully illustrated! They have different illustrators, but that doesn't take away from the story. Lisa Tawn Bergen delivers a wonderful message in each of the stories. Her most recent book, God Gave Us Love, shows the many kinds of love God created. The ones between a mommy & a daddy and with friends & family. And the most important relationship is the one we have with God. Lisa shares with children that sometimes it's not easy to love someone, but they can make the choice to love anyhow. I love how she discusses between the Grandpa and Little Cub how God shows us he loves us and how we can know he loves us. What a precious gift to share with our children! 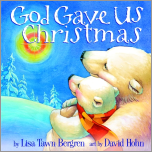 In God Gave Us Christmas, Lisa describes though an adventure with Mama and Little Cub how God is different and more important that Santa. They go on a trek to find evidences of God. Mama shows Little Cub the Northern Lights and shares about Jesus coming and Christmas beginning. Mama shares how powerful God is from an ice cliff falling into the sea. I love that Lisa doesn't knock Santa and in turn losing potential readers. Kids learn that Santa is a great reminder of "...good things like generosity and care." I'd love to share these books with you, but alas they will be going to my neice. Sorry. Thank you for visiting and learning more about Lisa Tawn Bergen's children's books. Thanks for this review. The books look like what I was looking for. I love Lisa Tawn Bergren! How fun that when I stopped by you were reviewing her, i will definately keep an eye out for these books.